Mansion House is a London Underground station in the City of London which takes its name from Mansion House, the residence of the Lord Mayor of London. It opened in 1871 as the eastern terminus of the Metropolitan District Railway. Today, Mansion House is served by the Circle and District lines. It is between Blackfriars and Cannon Street stations and it is in fare zone 1. 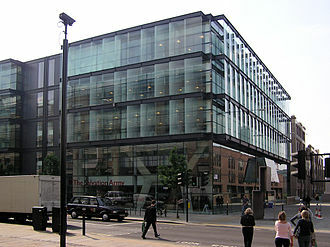 The station is located at the junction of Queen Victoria Street and Cannon Street. Mansion House is a sub-surface station with three platforms. The westbound platform, number 1, and the eastbound platform, number 3, are shared by both the Circle and District lines. A third platform was used for terminating eastbound trains, however it is no longer used and the track removed as services continue and terminate at Tower Hill. 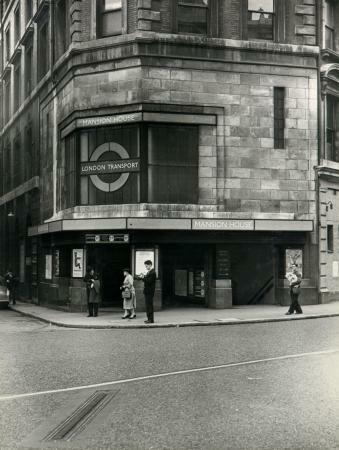 Despite the station's name, it is not the nearest tube station to Mansion House itself, which is in fact directly opposite an entrance to Bank station. Moreover, two other stations on the same District and Circle lines (Cannon Street and Monument) are also nearer to Mansion House than its namesake. Mansion House station was opened on 3 July 1871 by the Metropolitan District Railway (MDR, now the District line) when the company extended its line eastwards from St. Paul's station (which is now named Blackfriars). Mansion House became the new eastern terminus of the MDR. 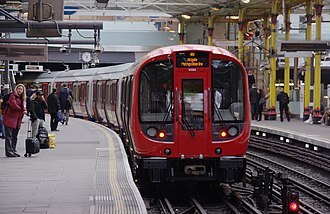 The MDR connected to the Metropolitan Railway (MR, now the Metropolitan line) at South Kensington and, although the two companies were rivals, each company operated its trains over the other's tracks in a joint service known as the "Inner Circle". On 1 February 1872, the MDR opened a northbound branch from its station at Earl's Court to connect to the West London Extension Joint Railway (WLEJR, now the West London line) which it connected to at Addison Road station (now named Kensington (Olympia)). From that date the "Outer Circle" service began running over the MDR's tracks. The service was run by the North London Railway (NLR) from its terminus at Broad Street (now demolished) via the North London Line to Willesden Junction, then the West London Line to Addison Road and the MDR to Mansion House. From 1 August 1872, the "Middle Circle" service also began operations through Westminster running from Moorgate along the MR's tracks on the north side of the Inner Circle to Paddington then over the Hammersmith & City Railway (H&CR) track to Latimer Road, then, via a now demolished link, to the West London Line to Addison Road and the MDR to Mansion House. The service was operated jointly by the H&CR and the MDR. From 1 March 1883, the District operated a service between Mansion House and Windsor, using Great Western Railway tracks from a junction installed just east of Ealing Broadway station, but it was unremunerative and ceased on 30 September 1885. On 10 October 1884, the MDR and the MR jointly opened the line eastwards to Mark Lane station (closed 1967), thereby completing the "Inner Circle". In 1897 the MDR obtained parliamentary permission to construct a deep-level railway running between Gloucester Road and Mansion House, beneath the existing sub-surface line. This new line was to be an express route using electric trains to relieve congestion on the sub-surface tracks. Mansion House was to be the terminus of the express route, with platforms 71 feet (22 m) below the sub-surface ones. No immediate work was carried out on the deep-level line, and the subsequent take over of the MDR by the Underground Electric Railways Company of London (UERL) and the resignalling and electrification of the MDR's routes between 1903 and 1905 meant that congestion was relieved without needing to construct the deep-level line. The plan was dropped in 1908. On 30 June 1900, the "Middle Circle" service was withdrawn between Earl's Court and Mansion House. On 31 December 1908 the "Outer Circle" service was also withdrawn. 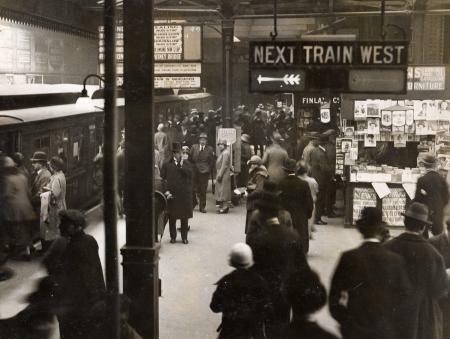 In the 1920s Mansion House station's entrance was rebuilt to a design by Charles Holden. 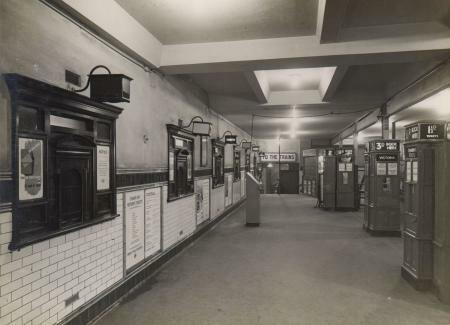 It featured a tall glazed screen with the Underground roundel similar to his station designs for the extension to Morden of the City & South London Railway (now the Northern line) opened between 1924 and 1926. In 1949, the Metropolitan line-operated "Inner Circle" was given its own identity on the Tube map as the Circle line. On 29 October 1989 the station was closed for the construction of a new entrance and for further renovation. It reopened on 11 February 1991. During the weekend of 8-9 October 2016 the west-facing bay platform number 2 was decommissioned and the track removed. The hydraulic buffer at the east end of platform 2 is extant (2018). London Buses routes 11, 15, 17, 23, 26, 76, 172, and 521 as well as heritage route 15H and night routes N11, N15, N21, N26, N76, N199, N550 and N551 serve the station. ^ Demuth, Tim (2004). "1881-1890". The Spread of London's Underground (2nd ed.). Harrow: Capital Transport. pp. 8–9. ISBN 1-85414-277-1. ^ Connor, Piers (1993). "The District Looks West". Going Green: The Story of the District line. Harrow Weald: Capital Transport. pp. 14, 16. ISBN 1-85414-157-0. ^ Day, John R. (1963). "The Metropolitan District and the Inner Circle". The Story of London's Underground (1st ed.). Westminster: London Transport. pp. 24–25. ^ Badsey-Ellis, Antony (2005). London's Lost Tube Schemes. Capital Transport. pp. 70–71. ISBN 1-85414-293-3. ^ Badsey-Ellis, Antony (2005). London's Lost Tube Schemes. Capital Transport. p. 220. ISBN 1-85414-293-3. Wikimedia Commons has media related to Mansion House tube station. The City and South London Railway was the first deep-level underground tube railway in the world, and the first major railway to use electric traction. When opened in 1890, the line had six stations and ran for 3.2 miles in a pair of tunnels between the City of London and Stockwell, passing under the River Thames. The diameter of the tunnels restricted the size of the trains, the railway was extended several times north and south, eventually serving 22 stations over a distance of 13.5 miles from Camden Town in north London to Morden in Surrey. Although the C&SLR was well used, low prices and the construction cost of the extensions placed a strain on the companys finances. In 1933, the C&SLR and the rest of the Underground Group was taken into public ownership, its tunnels and stations form the Bank Branch of the Northern line from Camden Town to Kennington and the southern leg of the line from Kennington to Morden. In November 1883, notice was given that a bill was to be presented to Parliament for the construction of the City of London & Southwark Subway. The railway was to run from Elephant and Castle, in Southwark, south London, the tracks were to be in twin tunnels 10 ft 2 in in diameter, running for a distance of 1.25 miles. 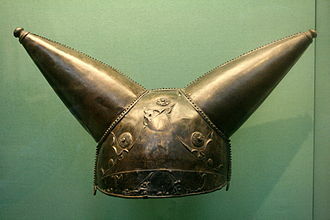 The bill received assent as the City of London and Southwark Subway Act,1884 on 28 July 1884. Section 5 of the Act stated, The works authorised by this Act are as follows, with Newington Butts and terminating at King William Street. The subway shall consist of two tubes for separate up and down traffic and shall be approached by means of staircases, in 1886, a further bill was submitted to Parliament to extend the tunnels south from Elephant and Castle to Kennington and Stockwell. The tunnels on this section were of a larger diameter –10 ft 6 in. Before the railway opened, a further bill received assent, granting permission to continue the line south to Clapham Common, the act was published on 25 July 1890 as the City and South London Railway Act,1890, effecting a change of the companys name. Like Greatheads earlier Tower Subway, the CL&SS was intended to be operated by cable haulage with an engine pulling the cable through the tunnels at a steady speed. Gloucester Road is a London Underground station in Kensington, west London. 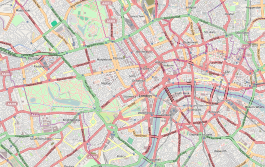 It is served by the District and Piccadilly lines, on the District and Piccadilly lines, the station is between South Kensington and Earls Court, and on the Circle line, it is between South Kensington and High Street Kensington. It is in London fare zone 1, the station entrance is located close to the junction of Gloucester Road and Cromwell Road. Close by are the Cromwell Hospital and Baden-Powell House, a variety of underground and main line services have operated over the sub-surface tracks. The deep-level platforms have remained largely unaltered, a disused sub-surface platform features periodic art installations as part of Transport for Londons Art on the Underground scheme. 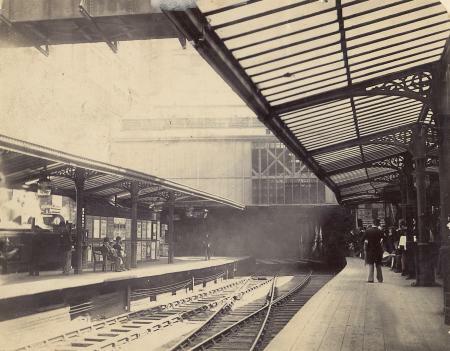 The station was opened as Brompton on 1 October 1868 by the Metropolitan Railway when it opened an extension from Paddington, the station was provided with four platforms sheltered by an elliptical glazed iron roof. 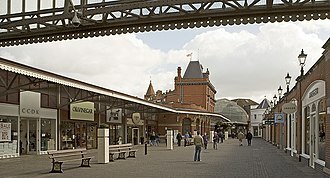 A two-storey station building in cream-coloured brick with arched windows and a balustrade at roof level was built at the eastern end. Initially, the MR operated all services over both companies tracks, on 12 April 1869, the DR opened a south-westward extension from Gloucester Road to West Brompton where it opened an interchange station with the West London Extension Joint Railway. At the opening there was no intermediate station – Earls Court station did not open until 1871 –, on 1 August 1870, the DR opened additional tracks between Gloucester Road and South Kensington and the West Brompton shuttle became a through service. On 3 July 1871, the DR opened its own tracks between Gloucester Road and High Street Kensington, on 1 February 1872, the DR opened a northbound branch from its station at Earls Court to connect to the West London Extension Joint Railway at Addison Road. From that date the Outer Circle service began running over the DRs tracks, the service was operated jointly by the H&CR and the DR. On 30 June 1900, the Middle Circle service was withdrawn between Earls Court and Mansion House, and, on 31 December 1908, the Outer Circle service was shortened to terminate at Earls Court. Earls Court is a London Underground station on the District and Piccadilly lines. The station is in fare zones 1 and 2. The station is located in the Earls Court area of central London, on the Piccadilly line the station is between Barons Court and Gloucester Road. It is the junction of the District line, with West Brompton and West Kensington to the west, High Street Kensington to the north. The Earls Court train crew depot is situated within the buildings towards the Warwick Road side of the station, it includes booking-on point, mess room. There are train stabling roads below nearby Hogart Road, at its opening, the extension had no intermediate station. The 1870s was a decade for the DR. On 3 July 1871 the DR opened a link from the West Brompton branch which connected to the Inner Circle south of High Street Kensington. Shortly afterwards, on 30 October 1871, the DR opened its first station at Earls Court, the original station was on the east side of Earls Court Road rather than the west. On 1 February 1872, the DR opened a branch west of Earls Court station to the WLEJR which it connected to at Addison Road. From that date the Outer Circle service began running over the DRs tracks, the service was operated jointly by the H&CR and the DR. On 9 September 1874 another extension was opened which took the DR west from Earls Court to West Kensington, trains from Earls Court could travel via five different routes and the stations efficient operation was central to the DRs success. Unfortunately, the location of the close to the eastern junction meant that the original station was congested. A fire on 30 November 1875 damaged the station and a substantial replacement was built to the west of Earls Court Road. It was opened on 1 February 1878, on 5 May 1878 The Midland Railway began running a circuitous service known as the Super Outer Circle from St Pancras to Earls Court via Cricklewood and South Acton. It operated over a now disused connection between the NLR and the London and South Western Railways branch to Richmond, the service was not a success and was ended on 30 September 1880. An experimental service was operated for six months in 1900 when electric trains were tested over the section of track between Earls Court and High Street Kensington. Mark Lane is a disused station on the London Underground. It was served by the Circle and District lines and it took its name from Mark Lane, the street on which it is located, slightly west of the current Tower Hill station that replaced it in 1967. 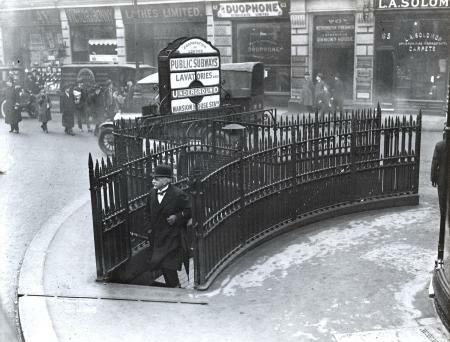 Mark Lane was planned to have been named Seething Lane, however the station was given the former name upon opening. On 1 September 1946 the station was renamed Tower Hill, the station was earmarked for closure due to overwhelming passenger numbers and little space available for expansion. 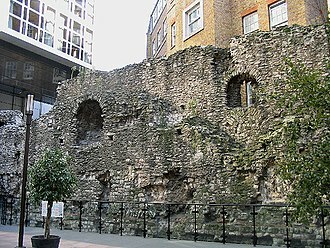 It was closed on 4 February 1967 and the present Tower Hill station was opened as its replacement, located on the same site as the Tower of London station that had closed in 1884. The sub-surface section of Mark Lane station can still be seen between Monument and Tower Hill, though only one platform on the track now remains due to redevelopment of the track. 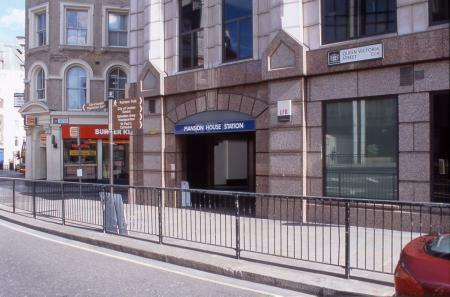 The surface station, sited in Seething Lane, can be seen in the form of a subway under the road, the offices above the station were called Mark Lane Station Buildings, and this sign can still be read above an entrance on Byward Street. Willesden Junction is a Network Rail station in Harlesden, north-west London, UK. It is served by both London Overground and the Bakerloo line of the London Underground.5 miles to the northwest, passenger services ended in 1962 when the platforms were removed during electrification of the WCML to allow the curvature of the tracks to be eased. Later the bridges for the North London Line were rebuilt, the High-Level station on the NLL was opened by the North London Railway in 1869 on a track crossing the WCML roughly at right angles. In 1894 a new high level platform was built, together with a new entrance. By 1897199 passenger and 47 goods trains passed through the High Level station each day. The Willesden New Station or Low-Level station on the Watford DC Line was opened in 1910 to the north of the line with two outer through platforms and two inner bay platforms at the London end. In 1896 staff totalled 271, including 79 porters,58 signalmen and 58 shunters and they issued 1,006,886 tickets to passengers in 1896, up from 530,300 in 1886. Many of them were housed in what is now the Old Oak Lane conservation area, built by the LNWR in 1889, the main-line platforms were numbered from the south side followed by the high level platforms and the DC line platforms which thus had the highest numbers. Later the surviving platforms were re-numbered, on 5 December 1910, a passenger train was in a rear-end collision with another at the station. Three people were killed and more than 40 were injured,23 of 25 passengers were injured, all but one were discharged from hospital during the same evening. There are no platforms on the West Coast Main Line, which is separated from the station by the approach road to Willesden Depot which lies immediately south-east of the station. Both platforms have been extended across the DC line to accommodate 4-coach class 378 trains, the HL station previously had a third platform on the eastern side which was used by services to/from Earls Court. There is another turnback siding further east which was previously used, in October 2014 the DC line was closed temporarily between Wembley Central and Queens Park reportedly by Network Rail to allow platform 2 to be extended further west as a through platform. The North London line is a railway line of the London Overground, which passes through the inner suburbs of north London, England. Its route is a rough semicircle between the south-west and the north-east, avoiding central London, the line is owned and maintained by Network Rail and London Overground. It is an important freight route and is used by the Richmond to Stratford service of the London Overground, between Richmond and Gunnersbury, London Undergrounds District line shares tracks with London Overground services, although this part is owned and maintained by Network Rail. The line reopened on 1 June 2010 with a service and none on Sundays, and with the upgrade work completed. The construction of the Royal Victoria Dock necessitated a swing-bridge on the route south of Canning Town which was rerouted in 1850 via Custom House. The original route was retained as the Silvertown Tramway, a freight line connected at both ends to the new main line. The main central section opened from 1850 to 1852 as the East & West India Docks & Birmingham Junction Railway and this gave a link from the Euston main line near Primrose Hill to the docks at Poplar via Bow. In the west, the North & South Western Junction Railway was opened in 1853 from Willesden Junction to a junction with the Hounslow Loop Line near Kew Bridge, the last link in the east was opened between the NLR near Victoria Park and Stratford in 1854. To obviate NLR trains running on the busy Euston main line, to give the NLR direct access to the City of London, the City extension to Broad Street was opened from Dalston Junction in 1865. The final part of the route was the opening of a link from South Acton to Richmond by the London & South Western Railway in 1869, the line from Broad Street to Kew Bridge and Richmond was electrified by the LNWR in 1916 on the 4th-rail DC system. In 1944, passenger services on the NLR Poplar branch ceased, freight traffic continued on the branch to the docks on the Isle of Dogs until 1980. The trackbed of the part of the branch, from Poplar to Bow, was used for the Docklands Light Railway branch to Stratford. The service was listed for closure in the 1963 Beeching Report and it was saved after a huge campaign. South Wimbledon station, one of the stations for the extension of the City and South London Railway. The narrow central platform at Clapham Common with tracks on both sides dates from the 1900 extension. Location of Mark Lane station on an 1888 plan.